A CSIRO developed technology which stops cut apples from going brown is now being used to sell pre-sliced apple bags in the United States. 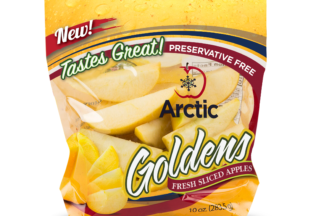 ‘Arctic apples’ will be sold in the US through a Canadian biotech company, Okanagan Specialty Fruits. The company are the first to licence the CSIRO’s non-browning technology. Okanagan Speciality Fruits founder Neal Carter has been working on the apples since the mid-1990s. “I came across research from CSIRO that had managed to ‘turn off’ browning in potatoes,” Carter said. How do the apples not brown? The CSIRO says while there are other sliced apple products available that are persevered to prevent browning, they are often coated in vitamin C and calcium which can change their taste. Apples turn brown after they are cut because of a naturally occurring enzyme called polyphenol oxidase (PPO). The enzyme that reacts with other components in the fruit cells when these cells are ‘broken’. This creates the brown colour. CSIRO scientists built an anti-PPO gene which when inserted into plants blocks the production of PPO and stops the browning.